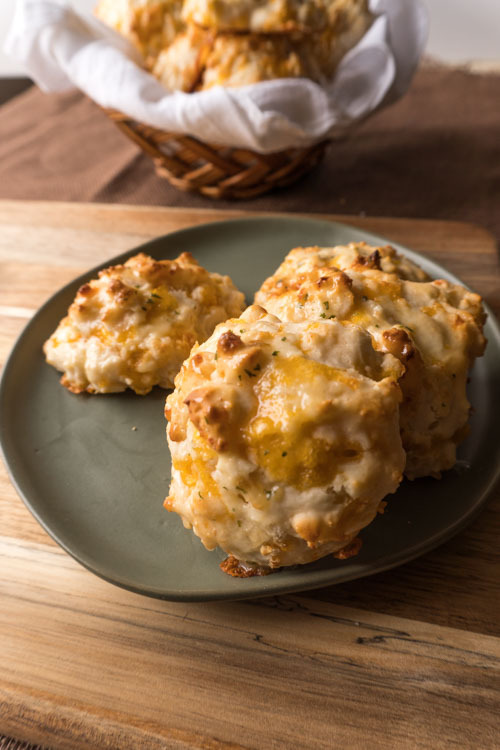 These cheddar cheese biscuits are so easy to make and they taste soooo good! I made two batches of these and sent them as a treat with my husband, to his work. He informed me, when he got home, that everyone loved them! For something so simple it was wonderful to hear it was a hit! Now, when I say simple, I’m not kidding! 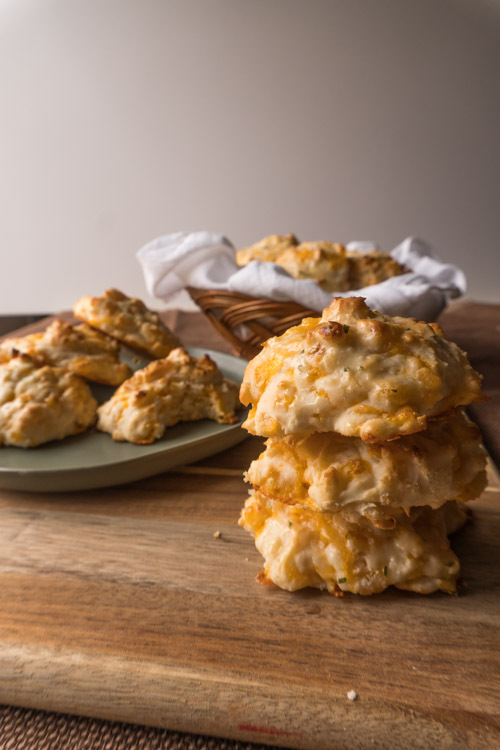 These cheddar cheese biscuits come together so fast and bake quickly too! All you need to do is grab some bisquick, mix with the cheese, then add in the milk, sugar and garlic powder! DONE! Okay, well you still need to bake them, which only takes 8-10 minutes. Then you can brush with your butter mixture and eat to your hearts content. 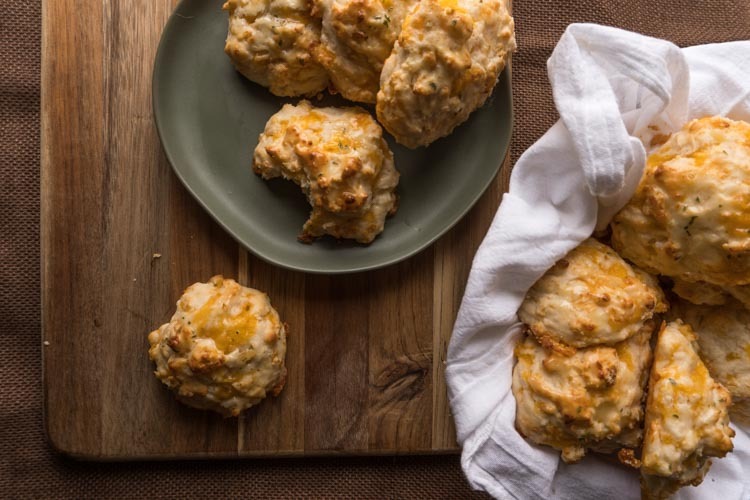 A warm cheddar biscuit straight from the oven- yes please! When I first made these I had no idea how big to form the batter on the baking sheet. So of course I went big and made six. Well, they were huge and very delicious. My second batch I separated into nine biscuits and they were the perfect size. But, I realized I could make them even smaller and they would still bake to a satisfying size, plus would feed more people. 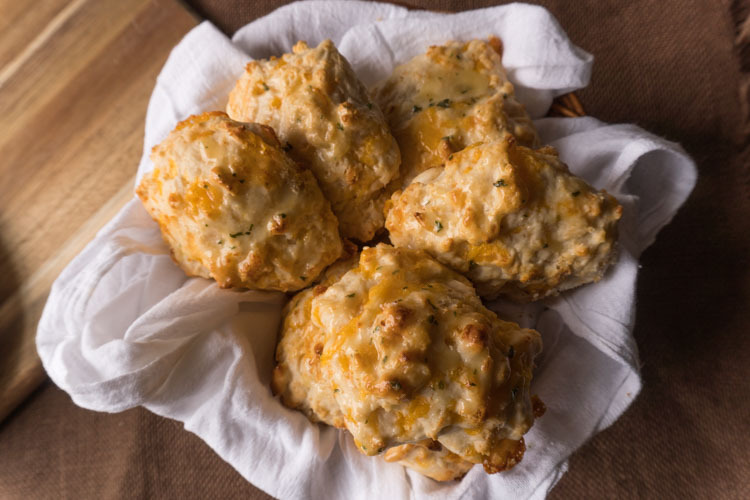 Regardless, you can’t go wrong with this cheese biscuit recipe. I was thinking of even adding a few more spices next time. Maybe try some rosemary or chunks of fresh garlic, or trying different cheeses? YUM! The possibilities are endless! These are definitely my go to for biscuits. 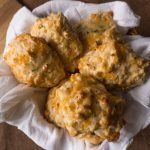 They are probably the best cheese biscuits I’ve had, or at least one of the top three! Let me know how you like them in a comment below! For other yummy recipes check out my easy homemade rolls, this delicious turkey salad with cranberries, or one of my favorites, this leftover turkey enchilada recipe! 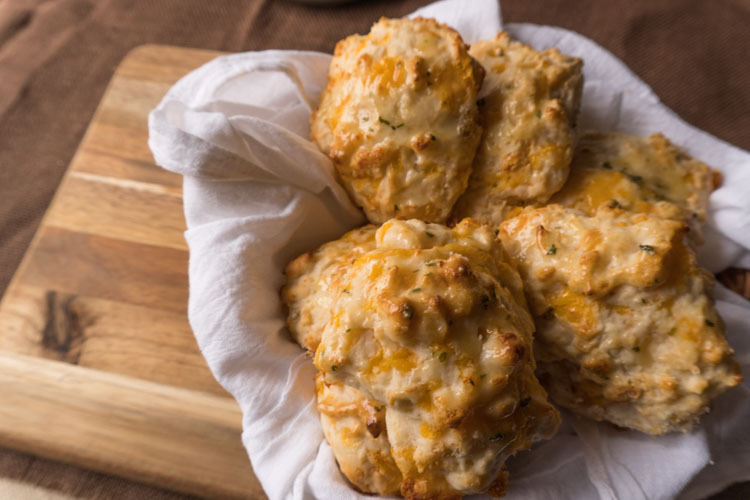 Whip up these delicious and easy cheese biscuits that everyone will love! In a medium mixing bowl, combine bisquick with cheddar and parmesan cheese. Add milk, sugar and garlic powder to bisquick mixture and stir until just combined. While baking, melt butter in microwave, in a small microwave safe dish. Add parsley and garlic powder to butter and mix thoroughly. When biscuits are baked, brush butter mixture on top.